I have 7 bantams, all from feed stores around my area. I have 2 turkens, 2 silkies, 1 cochin, 1 australorp, and 1 polish. They're 5 weeks old as I write this, but I will add more pics as they get older. This was our first batch from the first feed store we went to. We picked up the other 3 a couple days later. I didn't get pics of the other three at 1 week.. I started taking pics of them at 2 weeks. ..And Mr. Peeper, who has been growing so fast, he's suddenly unable to hold his own weight. We're treating him for splayed leg currently. Merlin is growing such big wattles.. And he's started hopping around like a boxer whenever I come near him! Thanks for sharing your experiences, sayga! I will keep an eye out for pointy or rounded feathers! Nice! Your chickens are so cute! Amazing pictures! Our "Princess Celestia" turned out to be a male. We rehomed him to a lady who said she was going to keep his original name. 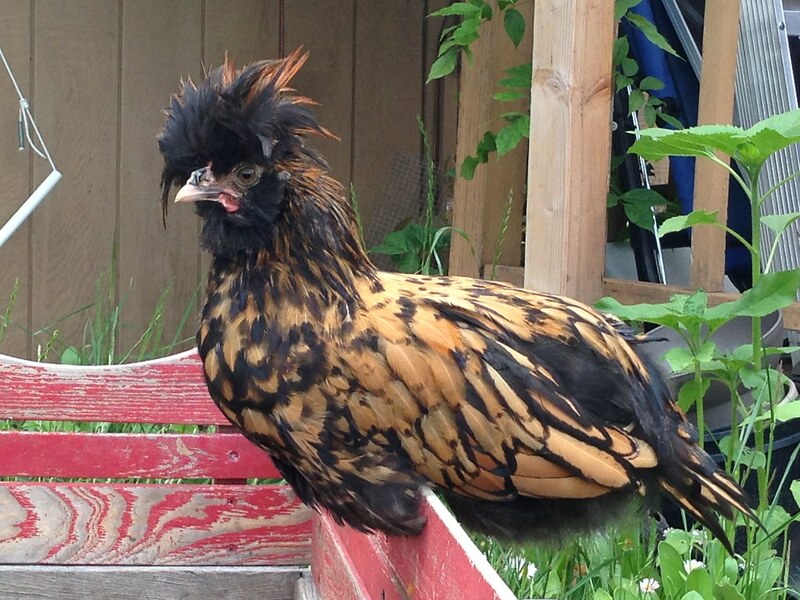 We couldn't tell he was a rooster until his pointy crest feathers came in. They not only were spiky-ended, but also golden instead of mostly black. He was 3 months old in this photo. You should know soon. And "Spike" was named after the boy dragon in My Little Pony, and "he" turned out to be a she. We could've swapped names, but by then we were pretty settled on each name. We just love Spike. We had a 3rd, another hen named Pinky Pie. She was disabled and couldn't walk by the time she was 6 months old, so we carried her in and out of the cop every day, brought her inside to lay on a towel and eat treats all day when it was cold out... She was spoiled rotten until she died around 7-8 months old. Great to know, sayga! I'm really hoping that Steve is a hen.. Steve seems pretty gentle too, but he does get spooked sometimes when he can't see me coming at him. Aren't the GL Polishes just beautiful?! I have a Golden Laced Polish too. Her name is Spike. She looks just like your Steve, of course. Seeing your pictures reminded me of watching her grow up last spring. She's a good egg layer. 5 per week I'd guess. And she's friendly and so docile and gentle. We adore her. Haha! They really do look like snowmen! 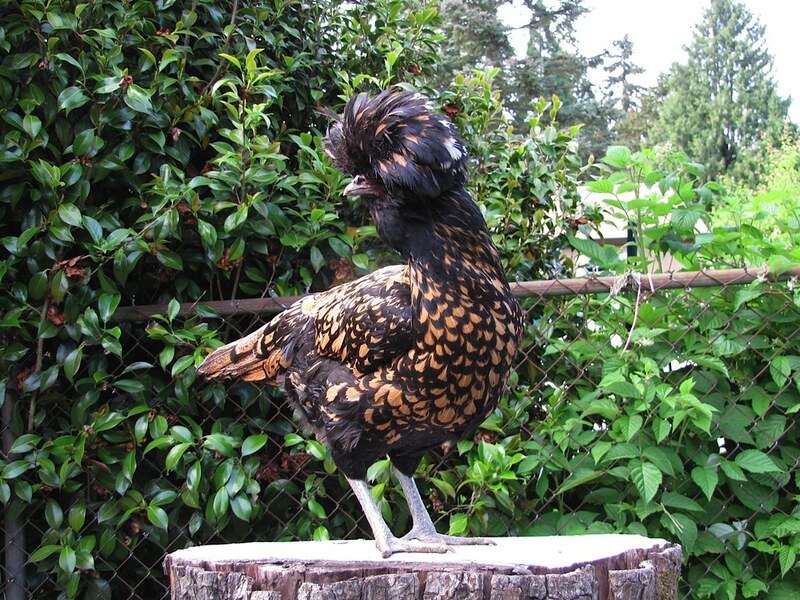 My silkie is one of my sweetest chicks though, so I don't know if I would be able to give her the name of a monster!